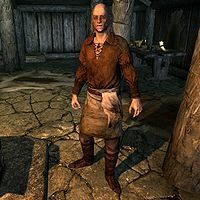 The Griefstricken Chef is a Nord warrior who may appear inside Windpeak Inn in Dawnstar during the quest The Dark Brotherhood Forever. He will only be enabled if the Night Mother picks him as the contract giver. He wears a set of barkeep clothes along with a pair of shoes. He carries his copy of A Kiss, Sweet Mother and wields an iron dagger. According to game data, he was originally meant to be found in the now non-existent village of Heljarchen, rather than Dawnstar. This page was last modified on 26 February 2014, at 19:45.